San Clemente City Council says there are serious safety issues at San Onofre. City Council voted 5-0 to support needed critical safety improvements at San Onofre. San Clemente City Council unanimously passes Resolution 13-53 regarding the urgency of removing the dangerous nuclear waste from San Onofre, based on geographic conditions and dense population. The resolution was submitted as a comment to the NRC Waste Confidence Generic Environment Impact Statement (GEIS). The NRC GEIS concludes it is safe to store the tons of nuclear waste at all nuclear plants indefinitely. City Council votes to send the following letters regarding San Onofre safety, cost and reliability concerns. Letter to the California Public Utilities Commission, urging them to not delay adopting its Order Instituting Investigation (OII) regarding [cost and reliability of] the San Onofre nuclear plant. Letter to the Nuclear Regulatory Commission, expressing concerns about safety issues at San Onofre, including the spent fuel stored on-site. Includes previous letters sent to Chairman Jaczko and Senators Barbara Boxer and Dianne Feinstein. 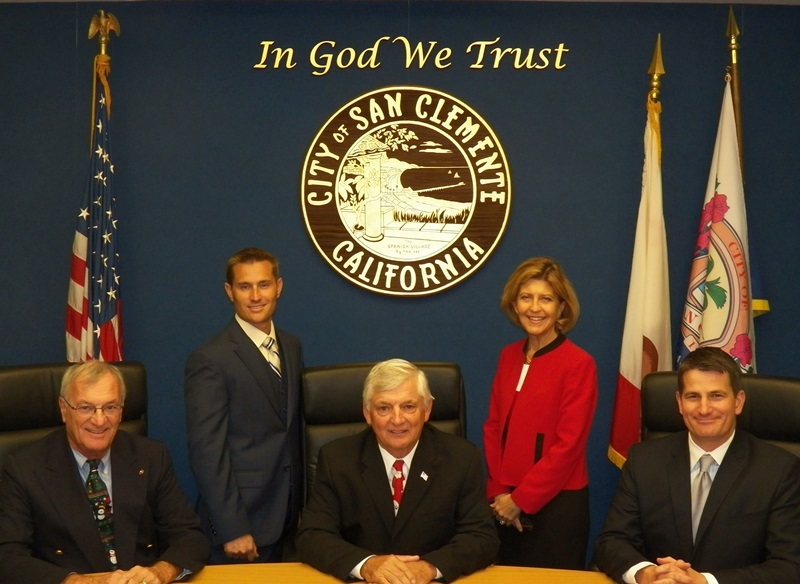 The San Clemente City Council sponsored several meetings and presentations regarding the implications of Japan’s Fukushima Daiichi Nuclear Disaster for the San Onofre Nuclear Generation Station. This resulted in their conclusion that there are serious safety issues at the San Onofre nuclear plant. Here are some key documents and presentations from those city council meetings. City Council sends November 2011 letters to elected officials and regulatory agencies requesting action and support of changes needed to address San Onofre safety issues. Letters sent to all Orange County city mayors and County Board of Supervisors, Congressmen Ken Calvert and Darrell Issa, Senators Barbara Boxer and Diane Feinstein, the California Public Utilities Commission and Nuclear Regulatory Commission Chairman Gregory Jaczko. a. Support Senator Boxer’s and Feinstein’s efforts to advocate that the NRC modify its relicensing policies in order to assure a full reexamination of design basis elements, including seismic and tsunami hazards, operational issues, plant security, emergency preparedness, and spent nuclear storage options. b. Insist that the NRC require that utilities move spent fuel rods to dry cask storage as soon as individual rods can safely be moved. c. Support Senators Boxer’s and Feinstein’s call for the NRC to implement the short-term recommendations in the NRC 90 Day Task-Force Report as soon as possible and that it develop a feasible plan for implementing longer term recommendations. a. Ask our Federal Elected Officials to demand the establishment of a permanent, safe, disposal site for spent nuclear fuel and the establishment of temporary sites, if necessary, to move spent fuel away from our community. b. Ask our Federal Elected Officials to insist that a permanent off-site storage solution for spent fuel be identified before relicensing is granted to SONGS. c. Ask our Federal Elected Officials to review the risk/benefit analysis that NRC uses to ensure that it adequately assesses public risk levels. d. Support our Senators’ efforts to ensure the NRC implements the short-term recommendations in the NRC 90 Day Task-Force Report as soon as possible and that it develop a feasible plan for implementing longer term recommendations. 3. Request that the California Energy Commission and the California Public Utilities Commission support the proposed Southern California Edison enhanced seismic study of the region so that it begins as quickly as possible. 4. Pursue additional funding for the extension of La Pata as an additional evacuation route from San Clemente. This is invaluable, Bert. Thank you. It’s going to take an “Occupy” type of action before these requests to take action will move forward.